What would you have our delegate know as he goes to the 2019 General Service Conference in New York? 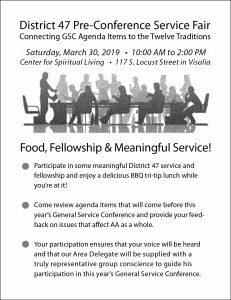 Connecting GSC Agenda Items to the Twelve Traditions – Food, Fellowship & Meaningful Service! Participate in some meaningful District 47 service and fellowship and enjoy a delicious BBQ tri-tip lunch while you’re at it! Come review agenda items that will come before this year’s General Service Conference and provide your feed-back on issues that affect AA as a whole. Your participation ensures that your voice will be heard and that our Area Delegate will be supplied with a truly representative group conscience to guide his participation in this year’s General Service Conference.